Every year when the holidays roll around, I get a little bummed out about our family’s lack of annual Christmas traditions. Moving as often as we have, we’re continually reinventing the wheel when it comes to celebrating the holidays: different people, different places, different decorations, different spaces. We do plenty of fun and festive things each Christmas, but it’s always…different. Even during the years when we’ve stayed in one place, sometimes our schedule or budget prohibits us from doing things we’ve enjoyed in years past. I can’t help but feel like I’m missing out when I see others’ annual Christmas parties, annual shopping outings, annual trips to see The Nutcracker, holiday teas, cookie swaps, and annual Christmas Eve dinners. I would love to automatically block off certain dates every December for something that “we always do,” instead of staring at the squares of a blank calendar and trying to fill it with things that will hopefully make the Christmas season feel special and memorable for my kids. The Lifesavers candy book in my stocking every year…. And, most notably, cheese straw spitting. Yep. Cheese straw spitting. See, when I was growing up, it was our family’s tradition to visit my Grams’ house every Christmas Eve night. She always had a table set with shrimp cocktail, pulled pork, and a platter of crudite with my favorite tiny pickles. One year, she decided to spice things up by adding some cheese straws to the table. My brother, who was probably about eight years old at the time, took one bite of a cheese straw, made a face, and immediately spit it out into a nearby plant. Nobody saw him except me, and we found that to be absolutely hysterical (you really had to be there). A new tradition was born. Every Christmas Eve from then on, while the adults sat around peeling their shrimp and sipping their wine, we would sneak away to spit little bits of cheese straw into one of my Grams’ plants (sorry, Grams!). I’m only slightly embarrassed to admit that we carried on this tradition well into our 20’s, and if I was still able to spend Christmas Eve at my Grams’ house, you can bet I would still be spitting bits of cheese stick into a plant and laughing with my brother. I realize this tradition is bizarre. But my point in sharing this ridiculous story is to show how simple traditions can be. 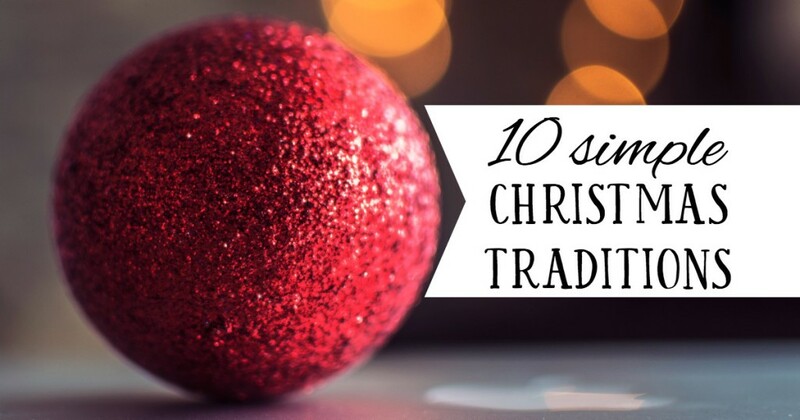 Traditions don’t need to be spectacular to be memorable. Yes, it would be fantastic to have an annual family tradition of ice skating at Rockefeller Center, followed by hot cocoa in Times Square and a visit to FAO Schwartz. But the only thing required to create tradition in your family is to do something over and over again, year after year. 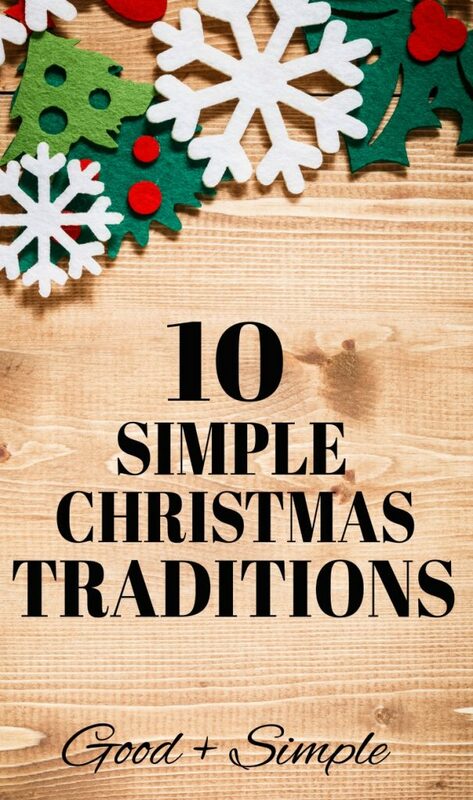 It’s the sameness and repetition that creates an unforgettable tradition, and there are lots of traditions you can start today and carry on throughout the years, regardless of where you live, how much free time you have, or how much money you have to spend. Vote on your family’s favorite Christmas cookie recipe and make it every single year. Choose a night to drive around and admire the best Christmas lights in your neighborhood, or visit a neighborhood that’s known for its beautiful light displays. Read “T’was the Night Before Christmas” or another Christmas book as a family together every year on Christmas Eve. Make or choose an annual ornament for your tree that represents something you did or enjoyed as a family that year. Include the date so you can look back at all the ornaments from years past. Start a collection of themed decorations (ie: Santas, deer, or gingerbread men) so that you have something fun to hunt for when you’re out and about during the holidays. Watch the same holiday movie together as a family every year, complete with popcorn and hot cocoa. Play a fun board game or gift exchange game on a night before Christmas (this is a fun idea I found online). Pack up cookies or other treats and deliver them to neighbors. Make scent memories by burning the same holiday candle year after year, or making stovetop potpourri throughout the season. Decide on a special appetizer or other dish that you only make on Christmas Eve or Christmas Day; or create a special Christmas breakfast that you make every year. If you’re looking for more ideas, just spend some time thinking about the things you remember and loved most about the holidays when you were a kid. Chances are, the memories that stuck weren’t necessarily the most elaborate or expensive events. It’s the tradition of doing something over and over again that ties you together as a family and creates the memories you’ll look back on and cherish (or at least laugh about). I’d love to hear about your favorite holiday traditions, and maybe pick up some new ideas. Please share in the comments! Yep, my husband and I were just talking about how Candy Land might need to disappear from our lives soon. :) Playing games gets a lot more fun when the kids are old enough to strategize, although it gets embarrassing when they start legitimately beating us! It is definitely the simple but meaningful things that make the holidays special. I love your list!